Boracay is not only the Philippines top destination but also it is the world's best island tourist spot based from the survey of a Travel and Leisure magazine for 2012. Nilou Motamed announced on Friday morning the result of survey and airs over Today, NBC TV show. 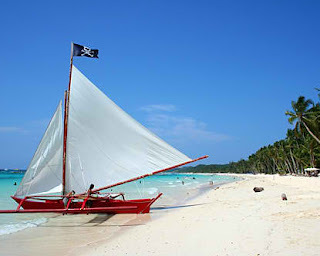 Travel and Leisure Magazine 2012 World's Best Awards also named Discovery Shores in Boracay as 'Best Hotel Spa' in Asia. Boracay got 93.10 points to lead the prestigious list of best islands and tourist spots in the world. It beats Bali which came in second with 90.41 points. "The world's best island, I confess to never having heard of it in the Philippines," "Today" host Willie Geist said. "This is important, Boracay. It beat out Bali, number 2. It's one of those islands you should know about if you're interested in culture and value," Motamed told Geist. Aside from Boracay and Discovery Suites, the winners in other categories are Bangkok (world's best city), Singita Grumeti Reserves (world's best hotel), Crystal Cruises (world's best large ship cruise line), Seabourn (world's best small ship cruise line), Viking River Cruises (world's best river cruise line), Singapore Airlines (world's best international airline), Virgin America (world's best domestic airline), Micato Safaris (world's best safari outfitter), Row Adventures (world's best tour operator), Hertz (world's best car rental agency), Red Mountain Resort (world's best destination spa), and Capella Pedregal (world's best hotel spa). The 17th annual "Travel + Leisure" World's Best Awards survey revealing readers' results for the favorite hotels, cities, islands, cruise lines, airlines, car rental agencies, spas, safari outfitters, and tour operators are listed on http://www.travelandleisure.com/ and will be featured in the magazine's August digital editions and its August print issue that will hit US newsstands on July 20. The 2012 World's Best Awards winners will be honored at a ceremony on July 19 that will be hosted by Novogrod and the magazine's vice-president and publisher, Jean-Paul Kyrillos, at the newly opened Conrad New York.